SKY Academy Boys 2010 are Champs! 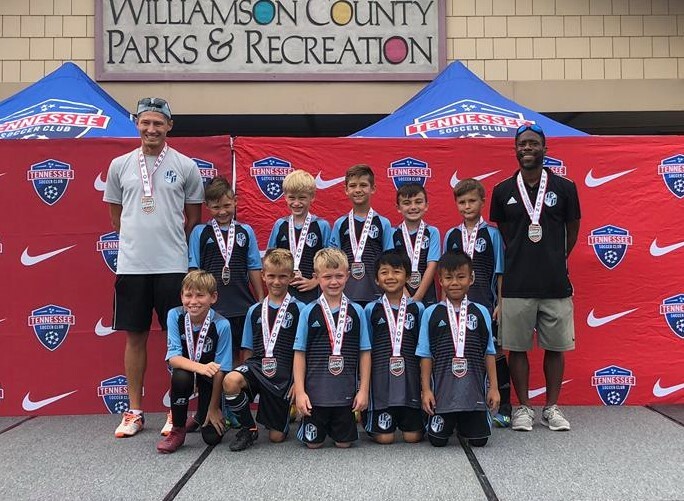 Over the past weekend, the 2010 Boys took part in the Battlegrounds - Tournament of Champions in Nashville, TN, They started off strong in their first game with a 8-3 win over Tennessee United. In the second game, against Nashville FC, the boys were having some woes putting the ball in the back of the net. The halftime score was 2-1. After some halftime adjustments, the boys came out blazing, scoring 3 goals in the first 8 minutes and ending with a final score of 7-1. On Sunday, the boys came ready to play! They got on the scoreboard early, and never looked back! They scored 8 goals over the course of the game, and never giving up one! They ended the tournament as Champions with a 3-0-0 record, scoring 23 goals and only giving up 4. Pictured: Back L to R: Coach Cory Dan, Rayyan Golubovic, Malic Mujic, Aldin Atic, Stefan Kuvac, Muradif Husic, Coach JaBree Jones. Front L to R: Anes Golubovic, Reed Johnson, Lincoln Sturgill, Anderson Mae, Micah Nyah.